Texas Governor Rick Perry issued a disaster declaration on Thursday for Tarrant, Dallas and Kaufman Counties, after seeing the devastation left behind by Tuesday's tornadoes. One of the cities hardest hit is Arlington. Mayor Robert Cluck and U.S. Senator John Cornyn took a tour of the damage in the city this morning. Mayor Cluck says the number of homes and buildings damaged or destroyed is worse than first thought. The number has grown to 532 structures, up from 428 at last count. The Mayor and Senator started the tour of Arlington at St. Barnabas Methodist Church, 5011 W. Pleasant Ridge Road. The tornado ripped off the roof of the church, uprooted trees, and caused serious damage inside of the building. Arlington resident Robert Henry says he knows it's going to be a long road to recover from the tornado. 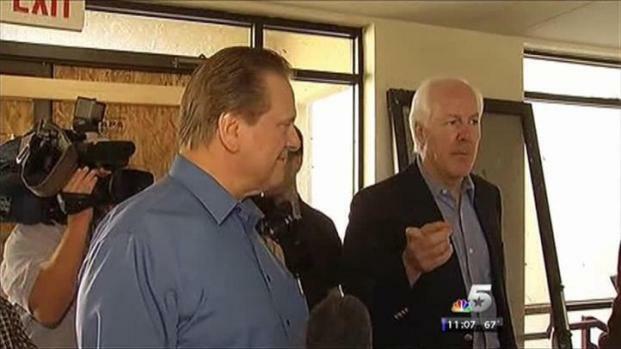 U.S. Sen. John Cornyn and Arlington Mayor Robert Cluck toured the damaged areas of Arlington on Friday. "You can do the initial clean-up, but it's going to take months to get it all done," Henry says. The twister tore through his neighborhood off Green Oaks Boulevard and Forest Bend Drive. The storm knocked down several trees on the entire street. "That's the thing that's irreplaceable. These are hundreds of years old," says Henry. His home was not spared in the storm. Henry will have to get a new roof. "Contractors come in and they're back-logged. 600 roofs, they've got to put on. Who knows when it will actually get done," Henry says. "It's terrible damage, it really is," says Mayor Robert Cluck. "Every time I drive around and see the damage, I'm impressed that no one was killed." The mayor showed Senator Cornyn the damage. Cluck hopes the senator can help federal funds flow from Washington, D.C. to the North Texas tornado victims. "We're here to make sure this is a seemless process," says Senator Cornyn. The city has set up a tornado recovery center at Fire Station 14, 5501 Ron McAndrew Drive in Arlington. They're anticipating a record number of volunteers, 500 to 1,000 people, who will be put to work. The mayor is expecting to get a dollar estimate of the damage from FEMA as early as Monday. Previous versions of this story included text from the Associated Press.